Bazna is situated on a tributary of the river Tirnava Mica , 17 km northwest of Medias and 6 km from the village Blaja . 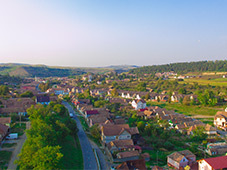 Bazna is built around two main streets that lie along the river . Bazna was documented in February 18, 1302 . 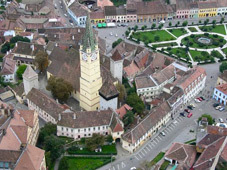 The authentic document confirmed that landlord Bozouch donated the village called Bazna to the Catholic Diocese of Alba Iulia. In 1359 Bazna is certified as free settlement in Medias county . Bazna develops quickly after Saxon settlers came from Germany and settled in this area. Historical documents mention that in 1516 in Bazna lived 82 Innkeepers, 3 widows , two shepherds and a teacher . The existence of methane gas in the village is recorded in historical documents in 1672 . Governor of the German population at the time, Franck Valentin von Frankenstein , told in verse about the existence of methane gas . Evangelical Lutheran Church was probably built in the second half of the fourteenth century , as the inscription seems to indicate a O REX GLORIAE VENI ( O King of Glory , come! ) on one of the bells, written in Gothic capitals . 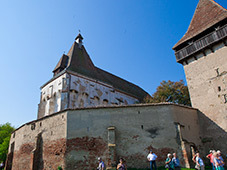 Medias Fortress, a fortified place of worship, was built in the early twelfth century, and the three defensive walls , erected by order of Matthias Corvinus probably between 1440 and 1534 . 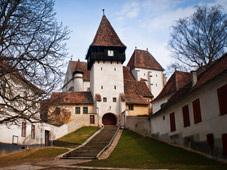 The first documentary attestation of Boian parish dates from 1309 in the act “Teodorich de villa Boneti”. Around 1400 the first church is build. A second phase of construction takes place is the beginning of the sixteenth century, when the church hall is build; walls have buttresses, ceiling has a ribbed vault star-shaped . The ceiling is raised, forming a tower . On buttresses and brackets, the semicircle arches support the fortified level. Shooting holes form elements of defense .